If you want to get an image of the Alps, you need seismometers surrounding the area. But how do you get the seismometers to work at the bottom of the sea? And how do you get them back? To explain this, we invite you to a virtual journey on board of the research vessel Maria S. Merian. It’s Sunday, 11th of February, and we pass through the Strait of Gibraltar. We are now 4 days in transit, and 2 more days to go before we can start the experiment. As the saying holds, a good preparation is half the work. So no time gets wasted, and all hands are used to test and assemble the equipment. 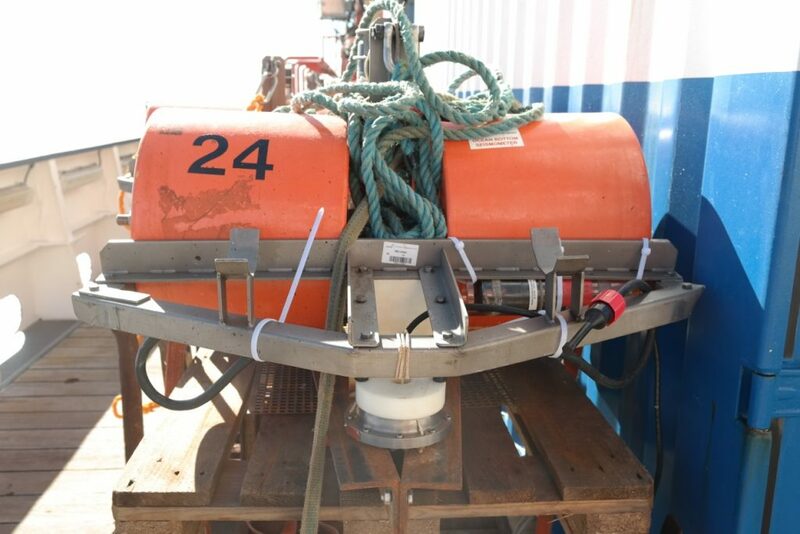 The equipment consists of so called “Ocean Bottom Seismometers” or “OBSs”. These OBSs will be used to record displacement and pressure, when a pressure gun shakes the earth underneath. So what do these OBSs look like? Each OBS consist of a seismometer; and a pressure meter or a “hydrophone”. They are assembled to an anchor and a floating or “buoyancy” devices, connected to each other via a “releaser”. When we send a signal to the releaser, it releases the anchor. With the buoy still attached to it, the OBS can float back to the surface of the water. But before we throw the OBSs overboard, we want to make sure everything works… For all 24 OBSs, and for another 11 separate hydrophones! For example, to check the releasers, the scientists attached them to a frame. 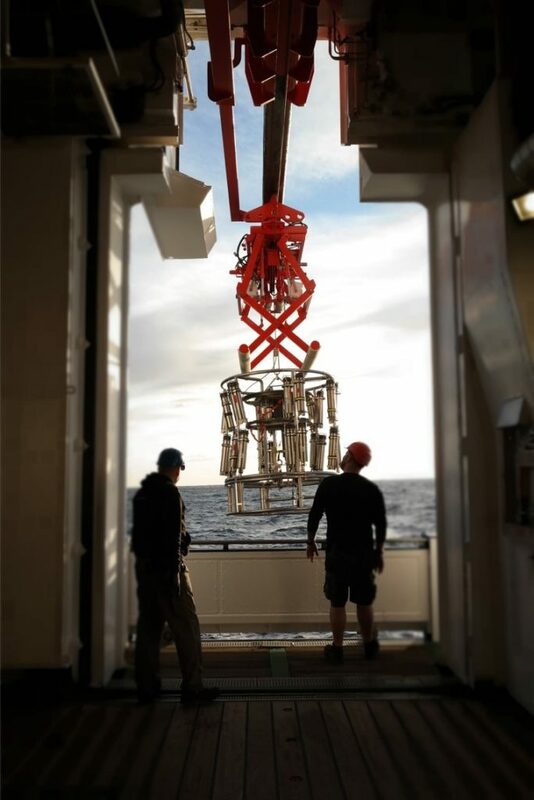 With the help of a crane, a rope and the crewmembers the whole system was brought down to no less than 1 kilometer depth! At this depth, we made sure that each releaser worked by sending a signal, to which they responded by opening. The hydrophones and seismometers were tested in the “dry lab” onboard. How? By dropping a ball on the table! This generates acoustic waves that appear on the hydrophones and the seismometers’ recordings. With all parts tested and approved, we made sure to attach all parts firmly. All set for the experiment to start! This entry was posted in ocean observation, plate tectonics.